Percy Harrison Fawcett went to the Amazon looking for paradise. He never returned. ROYAL GEOGRAPHICAL SOCIETY Percy Harrison Fawcett maps the frontier between Brazil and Bolivia in 1908. Fawcett, his son Jack and another companion were never heard from again, but their disappearance prompted a parade of would-be rescuers. With the US frontier closed, Africa carved up and the British Empire at its widest girth, “the big blank spaces in the map,” as a character says in Arthur Conan Doyle’s The Lost World, based partly on Fawcett’s earlier travels, were “all being filled in, and there’s no room for romance anywhere”–except for the opportunity to reprise Stanley’s feat and find a lost Victorian. By 1933 so many film crews, reporters and adventurers were converging on the Amazon in the hunt for the Fawcett party that the Brazilian government, to avoid having to save yet another writer looking for material or Hollywood actor hoping for publicity, put an embargo on future trips. Fawcett is often called the last of the great explorers, and the man who wrote his eulogy was Peter Fleming, brother of the creator of James Bond. In 1932 Fleming answered an ad in the London Times for “guns” to join a Fawcett search. An Etonian and recent Christ Church graduate, he had no doubt he would be picked. “An Old Boy,” he wrote, “is worth two young men.” The party didn’t find Fawcett, but Fleming’s account of the trip, Brazilian Adventure, became a bestseller. In its introduction, he confessed that he tried to “pile on the agony a good deal; I felt it would be expected of me.” He had, after all, a “free hand” in describing the “Great Unknown”; his predecessors had “made great play with the Terrors of the Jungle. The alligators, the snakes, the man-eating fish, the lurking savages, those dreadful insects–all the paraphernalia of tropical mumbo jumbo lay ready to my hand.” But finding the privations of the Amazon nothing compared with the dangers of London, Fleming opted to write a “strictly truthful” book. Sent by London’s Royal Geographical Society in 1906 to help Bolivia and Brazil map their Amazonian border, Fawcett became addicted to the jungle. Grann writes that Fawcett “conducted one expedition after another in which he explored thousands of square miles of the Amazon and helped to redraw the map of South America.” It was during these treks that the explorer came to believe in Z, which he placed somewhere in the Brazilian state of Mato Grosso. After the Great War, the idea took hold of Fawcett with pounding delirium. He thought Z to be the “cradle of all civilization,” perhaps even the lost city of Atlantis, finding confirmation of its existence in séances and mediums. Like Arendt’s fool, who after tours on empire’s front line couldn’t recover his “English self,” Fawcett grew agitated while in London. The city, he said, was as a “prison gate slowly but surely shutting me in.” At the same time, long periods abroad fortified a crystalline Victorianism, austere and unerring. And though Grann doesn’t speculate on this point, perhaps it was the allure of such purity that explains why so many–one chronicle puts the number at over a hundred–followed lemminglike to their deaths this last true Englishman. Roughly 4,000 miles long and home to more than 10 percent of the world’s species of flora and fauna, the Amazon contains the largest river system in the world, holding about 15 percent of the earth’s river water, expelling 57 million gallons per second. The main trunk and tributaries have been modified over the centuries with canals, footpaths and, increasingly, roads transforming nature’s baroque into human rococo, weaving an already bedazzling ecology of waterways and flood plains into an even more intricate set of nested trading systems, connecting nine of South America’s thirteen countries and, via Venezuela’s Orinoco River, numerous Caribbean nations. Yet compared with the industrial Mississippi, the Amazon, despite its grandeur, remains today largely an artisanal river. Its pilots rely on a lifetime of experience to navigate shifting sandbars, fast-changing depths and a powerful tidal bore that rushes ten miles upriver with a roar described by an early twentieth-century traveler as a “regiment of light artillery on the stampede,” leaving the largest of ships aground in its wake. And unlike the delta of the Mississippi, which over the past two centuries has been reduced from a patchwork of barely navigable bayous, islands, sandbars and estuaries to a rationalized sluice, the Amazon’s terminus remains variegated, with many metamorphosing routes in and out. In contrast, the Amazon–pure space in its own way–has been America’s irreducible extreme, a sinkhole enveloping desire and, from El Dorado to Z, laying waste to ambition. “There is nothing on that river but despair,” wrote the sixteenth-century Basque rogue conquistador Lope de Aguirre. None other than George Frost Kennan, in a lesser known “long memo” that made the case for extending his anticommunist containment policy to Latin America, compared the dynamism of the US landscape, which allows for an “organic intimacy” with nature, with Latin America’s “unhappy and hopeless” habitat. “In North America,” Kennan wrote, “the Mississippi drains and serves the great basin of fertility which is the heart of the continent. The Amazon, on the other hand, reaches great fingers into a region singularly hostile to human activity.” Where the United States was progress in motion, the revelation of God’s will–or History’s design–in the world, the Amazon’s “overpowering sensation of the absolute,” as the Portuguese writer José Maria Ferreira de Castro remarked, was stillness incarnate. The Brazilian jungle is the “last unwritten page of Genesis,” Euclides da Cunha wrote. Many proposals have been floated over the years to develop the Amazon and assimilate it into the United States’ domain. Theodore Roosevelt, at the start of an expedition he took in 1914, imagined it reduced to yeoman pastures, its rivers providing “unlimited motive force to populous manufacturing communities,” which would evolve into an “industrial civilization,” in effect extending the United States’ westward wave. Others thought Manifest Destiny flowed south, believing the Amazon to be an extension of the Mississippi. In the 1840s a Richmond newspaper argued that since Atlantic currents carried the Amazon’s waters north into the Gulf of Mexico, the river “may very properly be regarded as one of the tributaries” to “this our noble sea,” the Caribbean. A few years later, the Virginian Matthew Fontaine Maury, head of the Naval Observatory, thought the United States could avoid a civil war and keep its expanding cotton industry by purchasing the Amazon as it had Louisiana and using it to relocate planters and slaves. “How men from the Mississippi could make things hum along the Amazon,” waxed another Southerner. In metaphorical terms, though, the Amazon was more yielding than most places. It could be whatever you wanted it to be: a green hell, an Eden, a pleasure garden. Roosevelt thought it to be largely devoid of people, “entirely indifferent to good or evil,” working “out her ends or no ends with utter disregard of pain and woe.” For those readers not familiar with the theology that hell is the absence of God, the Rough Rider left little doubt as to the analogy he was drawing: he began an account of his journey with a detailed seventeen-page description of treacherous serpents. Yet at the same time, utopia always seemed to be waiting around the next bend in the river. In 1927 the New York Times reported a rumor that Fawcett had been found alive and well, living in a “veritable paradise,” a bountiful land “that has no owner.” The wayward Victorian had become entranced by the “sorcerous jungle and wished to know nothing more from the civilized world.” Another newspaper endorsed Fawcett’s reported “misanthropy” as an antidote to Jazz Age precocity and recommended sending, instead of explorers and scientists, poets and musicians to entice him back. Fawcett’s enduring appeal is that he vanished just as mass society was turning enchantment into kitsch. In their dispatches home, those who went looking for the British explorer continued to emphasize the jungle’s treacheries, working the Amazon more firmly into English-speaking popular culture. Yet with more and more people living in cities, pastoral waltzes and wanderlust ballads like “River of Dreams” and “On the Dreamy Amazon” figured the valley as melancholy, not unlike contemporary odes to the Mississippi, achieving, in a way, the yearned-for confluence of the two rivers. 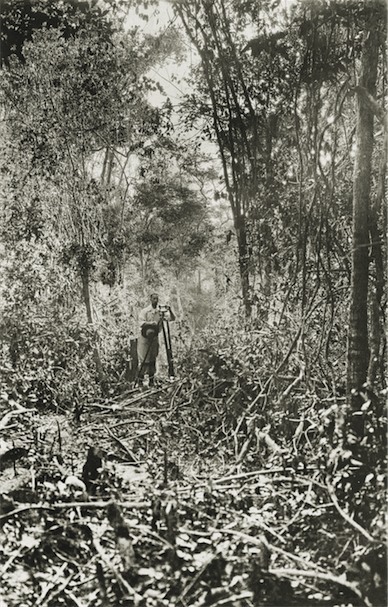 Grann’s rehabilitation of Fawcett rests on a rich paradox: Grann avoids reducing the Amazon to a canvas of Western fantasies about itself by defending Fawcett’s original vision of the jungle. Fawcett’s case for the existence of Z grew out of his appreciation of the expertise native Amazonians demonstrated in extracting medicine and food from their harsh environment, reinforced by hearing legends of a lost great civilization and reading early Spanish accounts of jungle “cities that glistened in white,” connected by “many roads” and “fine highways,” populated by skilled potters and other craftsmen. The “ethnology of the continent,” Fawcett said, was “built up on a misconception”–the fallacy being that the jungle’s severe ecology limited the possibility of large, sophisticated civilizations. In the years after Fawcett’s disappearance, environmental determinism became orthodoxy. Published in 1971, Betty J. Meggers’s Amazonia: Man and Culture in a Counterfeit Paradise, based on decades of fieldwork, drove home the idea that the forest’s extreme biodiversity was deceptive, that what appeared to be rich, dark soil was veneer, beneath which was mostly acidic sand. But recently a new generation of scholars, led by University of Illinois archaeologist Anna Roosevelt, Theodore Roosevelt’s great-granddaughter, has contested this view. Roosevelt, also drawing on extensive fieldwork, argues that Amazonia supported “very populous societies comparable to complex chiefdoms and small states known in other parts of the world,” whose farming technologies would allow them to transcend the limits of anemic soil. Now in her 80s and only recently retired as director of the Smithsonian’s Latin American Archaeology Program, Meggers dismisses those who argue that early Amazonians had built large cities, perhaps home to as many as a half-million people and rivaling those of the Aztecs and Mayans. “The myth of El Dorado,” she says, “just keeps going on and on and on. It’s amazing.” Meggers’s scholarship helped spur early campaigns to save the Amazon, and today she says the idea that the forest’s weak soil could support large populations has allowed developers to “operate without restraint,” accelerating the “pace of environmental degradation.” Revisionists insist that the civilizations they are describing were sustainable. Agriculture was oriented not toward profit-driven export but subsistence, and the sophisticated techniques of soil enrichment they have identified, including the charring of pottery and organic matter, could provide a model for the continual reuse of planting fields, limiting pressure to cut down more and more trees. “It’s not like loggers are revving up the chain saws after reading our articles,” says Brazilian archaeologist Eduardo Góes Neves. Until recently, stories told about the Amazon tended to emphasize its unconquerable enormity, which has repelled one challenger after another. That’s changed, of course, since the forest now appears to be fragile. Much of what was jungle during Fawcett’s last trek through Mato Grosso is now covered with soybeans, which, along with cattle and logging, are the primary agents of deforestation. The beans are grown for export to the United States, Europe and China and crossbred to survive ever more humid climes, which means there is no limit to how far planters can push into the Amazon. Since the 1970s, 20 percent of the forest has disappeared, and if the current pace continues, another 40 percent of what’s left will be gone by 2050. Slowing this deforestation will be Amazonia’s final test. Greg GrandinTwitterGreg Grandin, a Nation editorial-board member and New York University history professor, is the author of The Blood of Guatemala, The Last Colonial Massacre, and, forthcoming this spring, The End of the Myth: From the Frontier to the Border Wall in the Mind of America.